Republic is a Thai restaurant and it’s HUGE. It’s a bit deceiving from the outside, but once you walk in and up the steps, there’s a large and spacious area with communal tables and benches and the noise is so loud. However, it’s cheap, there’s variety in the menu, and it’s quick so it fits within our one hour lunch break. 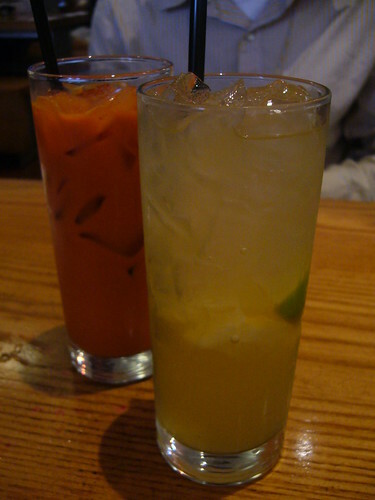 For drinks, we ordered the Thai Iced Tea (Ameya’s) and a Honey Kalamansi (me). What I really appreciated about both was that neither was sickeningly sweet and you could tell there was no artificial flavoring included in the making of the drinks. The Thai Iced tea was smooth and delicious and I only wish I could recall exactly what was in the kalamansi – honey, meyer lemon, thai basil? There was a lovely tartness from the lemon that lingered on the tongue a few seconds after drinking it. If anyone knows the recipe, please tell me!!! I’d like to try making some myself. Ameya ordered the Grilled Beef with rice angel noodles, mint, lettuce, jicama, and carrots and I got three small dishes –fried calamari with sweet chili sauce, grilled eggplant with lime juice, sesame seeds, and miso, and beef satay with a spicy peanut sauce. Service was quick and my goodness, these portions were HUGE! Ameya, a devoted meat lover, had trouble finishing the somewhat too-salty grilled beef skewers and I think that’s the first time I’ve ever seen him struggle eating beef. In the middle, he started taking it off the skewers and just wrapping it in the lettuce Korean bbq style before dipping it in the provided peanut sauce, which couldn’t compare to the one I had for my beef satay. My fried calamari was unfortunately, inconsistent. Some rings were rubbery and hard to chew while others were perfectly tender, but there was a sizable amount of crunch on the outside (well-seasoned too) and the chili sauce had just the right amount of sweetness to counteract the saltiness of the crusts. The eggplant, on the other hand, was just what I was craving at the time. Light, smoky, and a bit acidic from the lime juice. It wasn’t overcooked and mushy, but it did not have that raw taste either. The only way to improve this appetizer would be to create some spicy condiment to accompany it. 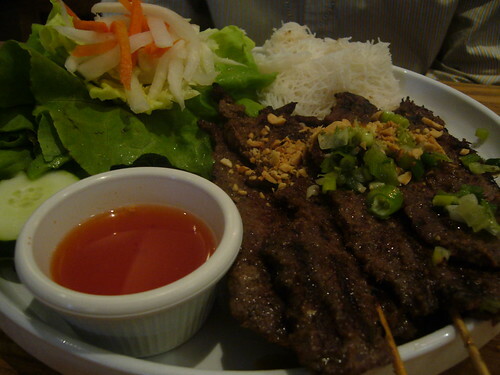 As for the beef satay, the result was similar to Ameya’s dish. Heavily seasoned, yet for the most part, rather tender, and paired well with a spicy peanut sauce that was both sweet and salty. I liked. 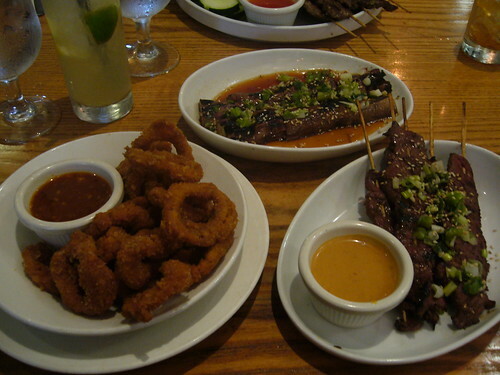 But those three dishes were pretty substantial, and I walked out of the restaurant feeling very full and very sleepy. So it shouldn’t be any surprise I didn’t get much work done after lunch. Next time: trying their noodle dishes, which is what they’re more famous for, especially their broth noodles. Eeeeeee! * Restaurant Week NYC is from July 21-25 and July 28-August 1 this year. Book your tables at opentable.com now! I know of some places I have in mind already. If you posted a picture of those calamari rings w/out telling us what they were, I would of thought they were onion rings. Chris – I never even realized that. Though, now that I look at the photo again, they seem a bit wide to be your typical calamari rings. Hm. Those look so refreshing! I just love kalamansi lime beverages! WonR Couple – It was the first time I’ve ever tried a kalamansi drink! And now I’m on the lookout for a recipe to make a pitcher of my own. You are currently reading People’s Republic at Notes on Food.